The key in this case is that is all the videos are advertisements. Content marketing is basically advertisements version 2. Ads with added value. Very insightful post. As a consumer, I prefer content marketing simply because as the article says here, it allows room for the consumers’ voice. It’s all about getting value from something I read or watch – reaping useful information and making use of what I learn. And then connecting that to what’s being promoted. Finally a non-podcast post! Thanks Demian! I used to work for a digital advertising firm but still, as a consumer, I prefer content marketing. It is less pushy and puts the consumer at the center compared with ads that are all about giving brands value. Digital agencies can pump out some good content marketing, too. They just have to educate their client that it’s a good idea. I think content marketing will become more powerful year by year if it’s main motto is to educate user. Content marketing help us to earn respect and trust from people who might buy our products or services. That is indeed it’s motto. Good call, Dinesh. Fantastic article! Clear with great examples. Your writing powers me up and let’s me know I’m on the right track with content marketing. Thank you for your passion and knowledge. You are welcome, Mr. Feeley. I love content marketing. So thanks for totally clarifying the difference between advertising and content marketing. I like to teach and help so content marketing is the perfect strategy for me. Also, like Canva and Unsplash, it gives the the little guy a way to compete with the big boys. Thanks also about sharing some of the history of CopyBlogger. Love it! You bet, Jupiter Jim, encouragement all around. Informative post, Demain. 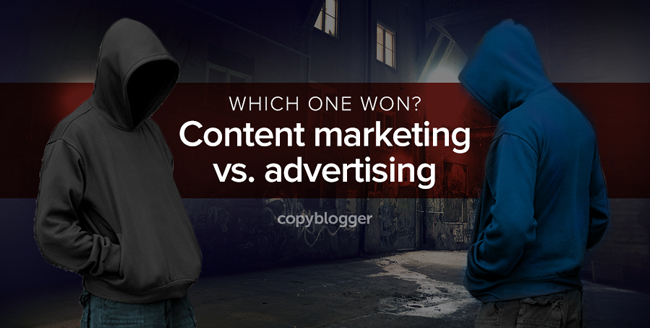 You simply reveal the difference between content marketing and advertising. I think content marketing is by far the most effective strategy to sell products and services. Customers certainly seem to love it. Thanks for stopping by Venkatesh. I don’t know that a direct comparison is appropriate because they do very different things for a sales funnel. Most advertising is entirely about being visible to a larger audience. Content marketing can drive traffic to a website but the larger part of what it’s about is conversions, engagement and retention. A big part of what’s going on with successful content marketing is that when potential customers start doing their homework on a business they’re thinking of purchasing from, they find interesting and substantial content that builds more trust, rapport and authority. I see advertising and content marketing as very complimentary. Certainly once you’ve got your content marketing producing results then you are in a much better position to test some ads. Hi – nicely written, but there is a big problem within this article. Your definition of content marketing doesn’t directly mention it at all, but immediately after the definition you have a section proclaiming that in content marketing “You own the media and the content”. You don’t have to own the media. Placing content marketing on a paid platform doesn’t magically turn it into advertising – it’s about the form of the communication, not whether it is paid or not. For example – if you placed your ad on your own website, is it suddenly not an ad? Yes, there is content marketing on owned media, but there is also content marketing on paid. Denying this is something that’s holding content marketing back from finding its true utility. Sorry I wasn’t clear Matt, but I’m not saying content marketing can’t be on paid media. I fully believe it can and recommend it. I’m just saying don’t lay all of your eggs in that basket. Good explanation on how to tell the difference. If the product is front and center, its an ad. If you’re educating, its content marketing. So if a brief ad on a deodorant product focuses on one particular ingredient that has been shown to reduce your risk of heart disease, that is not education and should not be treated as content marketing, is that correct? Also, do you think an online business should never ever place an ad on their blog? Would that always be a bad strategy? When could it work? Great article, Demian. Look forward to your response. Content actually does a better job in selling abstract ideas that can’t be easily evaluated on a trial basis or are not clearly apparent to the novice due to the high level of knowledge needed to know the differences between what you sell and what the competitor sells that may be cheaper than you. But what about combining media with content? Meet ads that offer “similar content” such as taboola or outbrain that are put in front of millions of people if you want to catch the smaller number who are actually interested in reading that content by creating a catchy title that offers to solve that users problem in the form of third party testimonial? From here, you can retarget those who read your content and know your story in Adwords using search based retargeting so people don’t forget who you are when they are actually ready to buy something like what you sell.